Not Enough Bone Support for an Implant? Here's a Way to Rebuild It - Kent R. Mauduit D.D.S. Due to financial circumstances, people often have a lost tooth restored with a removable partial denture, an effective appliance that restores function and a degree of aesthetic appearance. Later, though, they may want to improve both function and appearance with a dental implant. If this describes you, you’re making a great choice. Dental implants are the closest technology we have to a natural tooth. But there may be a roadblock to your implant, especially if a long time has passed since your tooth loss—there may not be enough bone at the site to place an implant. The heart of an implant is a titanium metal post surgically imbedded in the jawbone. The titanium naturally attracts bone cells, which grow and adhere to it to form a solid hold that can support a porcelain crown or other restorations like bridges or dentures. But to achieve a natural appearance it’s important that the implant is placed in the right location. To achieve that requires adequate bone. But there may not be adequate bone if the tooth has been missing for a while. The forces generated when we chew travel through the teeth to the jawbone, which stimulates bone growth. If that stimulus is absent because of a missing tooth, new bone cells may not replace older ones at a healthy rate and the total bone volume begins to diminish. A denture can’t compensate and, in fact, accelerates bone loss. But there may be a solution: bone grafting. 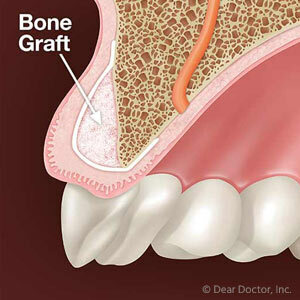 With this procedure we place a donor bone graft into the area of bone deficiency some time before implant surgery. The graft serves as a scaffold for new bone cells to grow upon. Hopefully, this will produce enough healthy bone to support an implant. If the bone deficiency is minor, we may place the implant and the bone graft at the same time. If you have experienced bone loss, we must first determine the amount of bone at the missing tooth site and whether grafting is a viable option. Bone grafting postpones your implant, but the delay will be worth the wait if we’re successful. With increased bone volume you’ll be able to obtain a new tooth that’s superior to your current restoration. If you would like more information on dental implants, please contact us or schedule an appointment for a consultation.